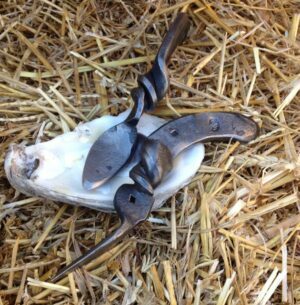 Carolina Shuckers are unique, hand-forged oyster knives created by North Carolina artists Kirk Davis and Mike Waller. The Giddy-Up Shucker is crafted from a reclaimed horseshoe. Your knife will last for generations and will make you the fastest shucker at the racetrack or where ever you choose. Shipping included.